How A Massive Power Outage Sent People Out In The Street Ten years ago, a tree on a power line in Ohio touched off the largest outage in U.S. history. In New York City, many people were so relieved it wasn't another terrorism attack that in some places, a carnival atmosphere prevailed. 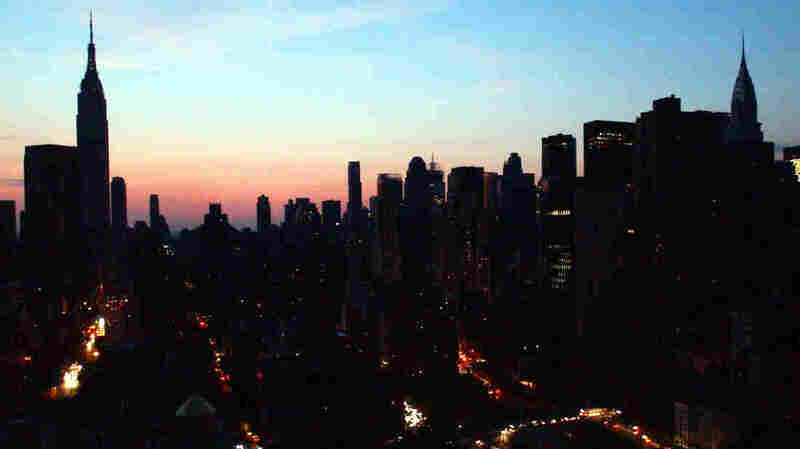 The New York City skyline is mostly dark in this photo of the 2003 blackout that hit U.S. and Canadian cities. On Aug. 14, 2003, a series of cascading power failures led to a blackout that spread across the Northeast and as far west as Ohio. Some 50 million people were affected, and the power outages lasted up to 31 hours. New York City was especially hard hit as the skyline went dark, and its 8 million residents coped without traffic lights or subways. We'll be exploring the lessons learned in the week ahead, but reporter Beth Fertig of member station WNYC reminds us what happened in her city. It was one of those dog days in August, a lazy afternoon when the temperature was around 90 degrees and New Yorkers were steeling themselves to commute home in the heat. My editor, Karen Frillmann, remembers saying, "There is nothing going on today. It is really a slow news day in New York." Five minutes later, a little after 4 p.m., the lights went out. 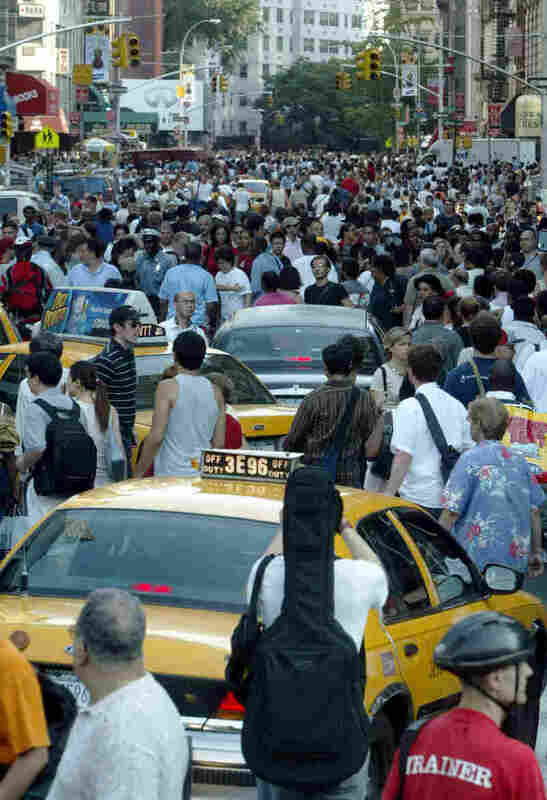 As New Yorkers looked out their windows, they could see this wasn't an isolated event. You have to remember: This was less than two years after the terrorist attacks of 9/11. People were still jittery and wondered if maybe, just maybe, this was the Big One. But soon, Mayor Michael Bloomberg made an announcement. "The first thing that everybody should do," he said, "is to understand that there is no evidence of any terrorism whatsoever." And then, a collective sigh of relief. Everyone poured out into the streets and started walking, or driving, though the going was slow. Brooklyn Borough President Marty Markowitz used a megaphone to cheer on thousands of people walking from Manhattan over the Brooklyn Bridge. "Welcome back home," Markowitz said on his megaphone. "Welcome home, Brooklyn, everything going to be all right. Everything's going to be all right." Many people hitched rides. Elizabeth Brown was stuck in Manhattan; she and her friend started walking to look for her husband, who said he would drive in from Brooklyn to get them. "So we started walking to the FDR, and we hitched a ride with this lady," Brown said. The driver was only going to 23rd Street, but they took the ride anyway. Not quite far enough, they hitched another ride with a man heading into Brooklyn. "I saw my husband on the other side I said, 'Wait, let us out, let us out! ... There he is!' " Brown said. This being New York, people also started hustling to make a buck. Convenience stores stayed open, and so did the bars. At the Red Lion in Greenwich Village, people played music and drank in the dark. Luke Rosen and Gwen Conroy were enjoying the scene. Rosen said everyone was "dancing in the street." "I think everybody's so chill because everybody knows it's not an attack, and it's just OK, it's only a blackout," Conroy said. "We'll get over it, you know. It could have been a lot worse." That's not to minimize things. At least six deaths were attributed to the blackout. Calls to 911 soared. Admissions to hospitals went up for respiratory problems. Hundreds of people were rescued from elevators. And there was looting. But overall, police said arrests were actually lower compared to the same time in 2002. By the next afternoon, the lights gradually started to return. As the sun went down, the skyline began returning to normal, lights twinkling from buildings and bridges. There were estimates the blackout cost the United States billions of dollars. But it wasn't the catastrophe people had feared. For most lucky New Yorkers, it was just an adventure.